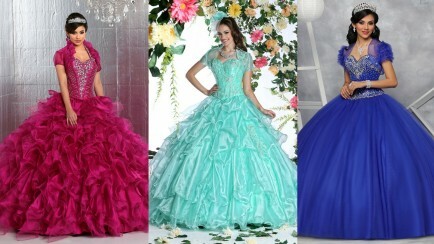 Are you longing for a lovely strapless Quinceanera gown, but don’t want to show as much cleavage? We’ve got just what you’re looking for! The trick to making a strapless dress modest without sacrificing elegant style is the cut of the neckline. 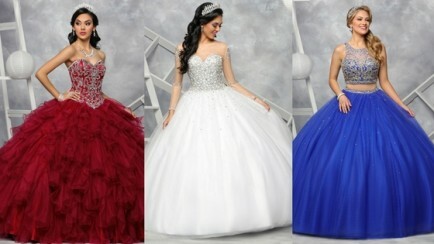 Each of these styles features a straight-across bodice that’s less revealing than a standard sweetheart strapless. And when you buy your dress from QbyDaVinci, you’ll get all the fashion style you expect, plus high-end construction, quality fabrics, and you’ll really love the prices and the quick shipping! 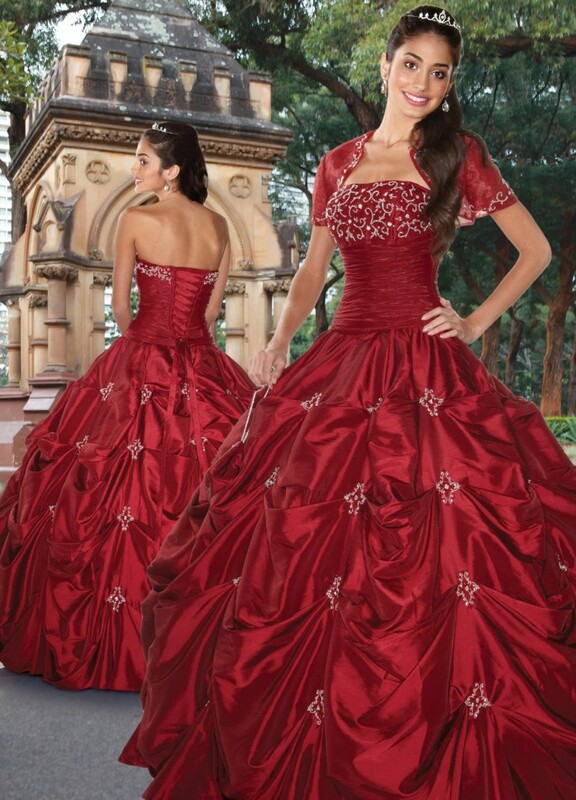 This beautifully traditional Latina design features a skirt with alternating ruffles of taffeta and lace. 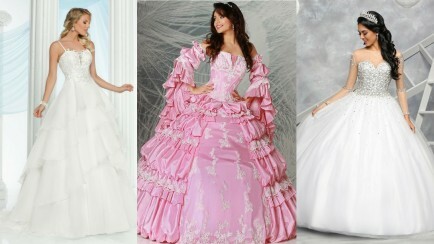 The straight-across bodice is highlighted with a lacy V-detail and accordion pleat taffeta fill. Order the beautiful gathered and ruffled sleevelets and wear your hair down for a lovely modest look. 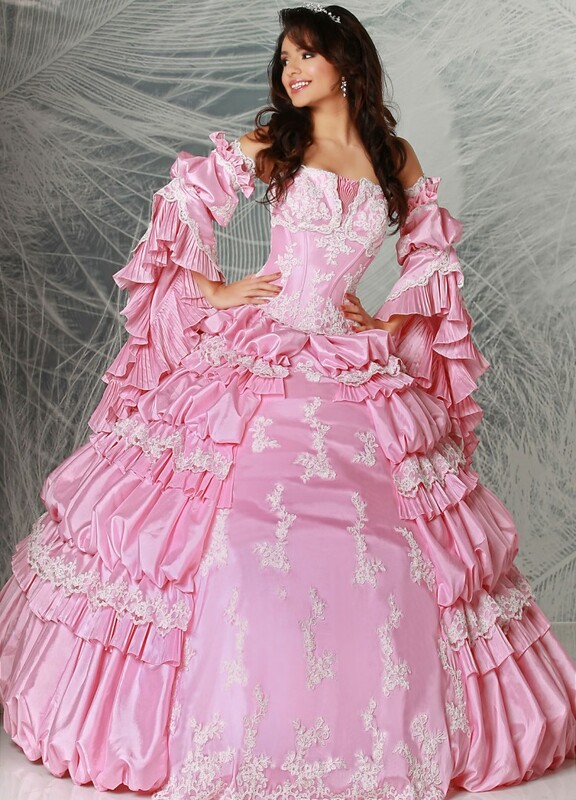 The defining feature of this Quinceanera dress is the boned bodice with jeweled torso highlighting a pleated straight-across bodice with a lovely rosette. Order a taffeta bolero to match for more modesty. 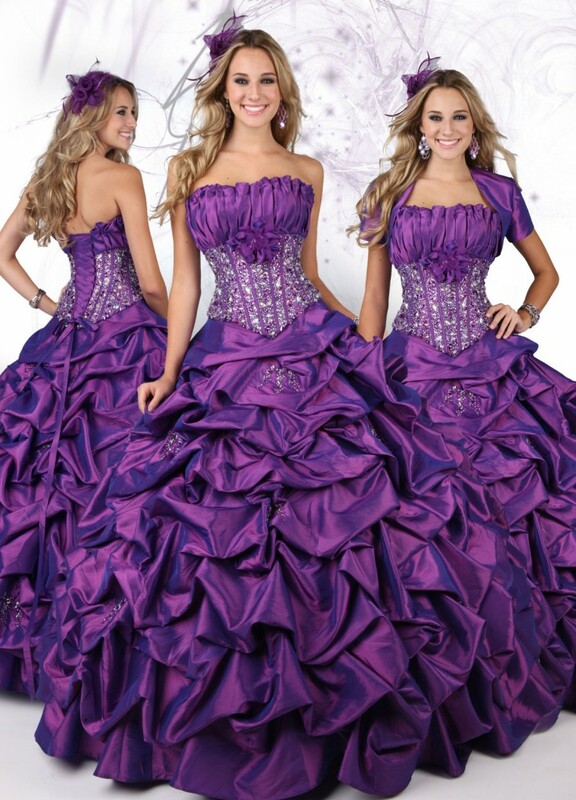 The taffeta skirt with embellished pickups is just beautiful, and the gown and bolero are available in Purple (shown) as well as Fuchsia, Royal Blue, and White. The subtle ruffle across the top of the straight-across bodice sets this dress apart. The bodice is also boned with a distinctive jewel and sequin embellishment that creates long, slimming lines into a dropped waist with an offset rosette accent. 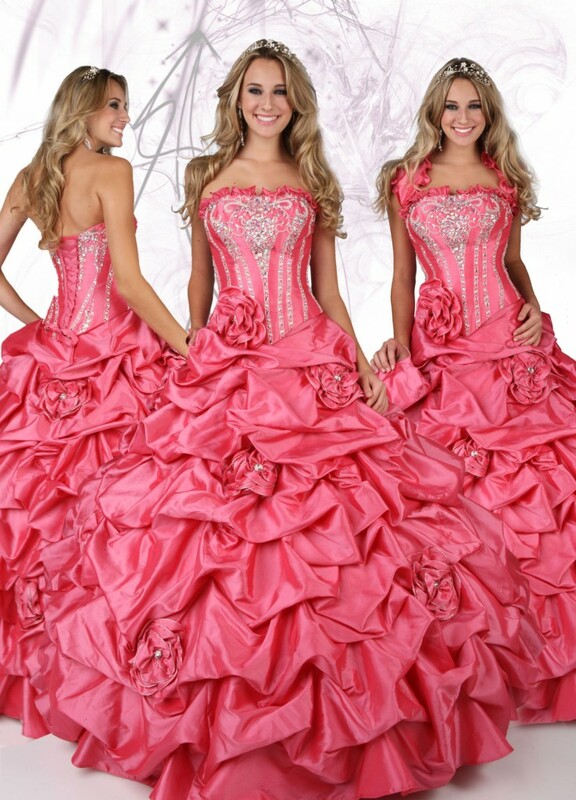 The skirt features rosette pickups, and the optional bolero is also ruffled. This lovely organza gown features subtle beading highlighting the bosom, leaving a long, ruched torso line dropping from the straight-across neckline. 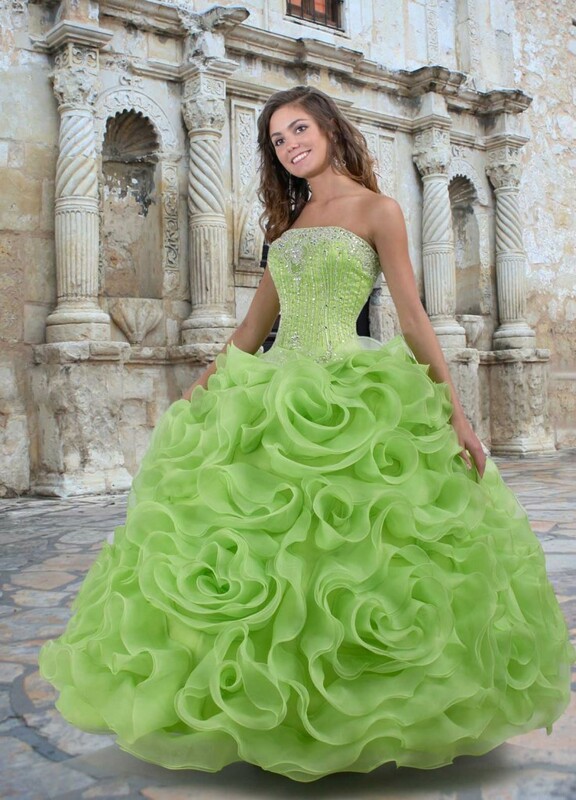 A cloud of organza ruffles completes the lovely look. The simple and elegant straight-across neckline with subtle embroidered bosom embellishment and a smooth, sleek torso is the highlight of this dress. 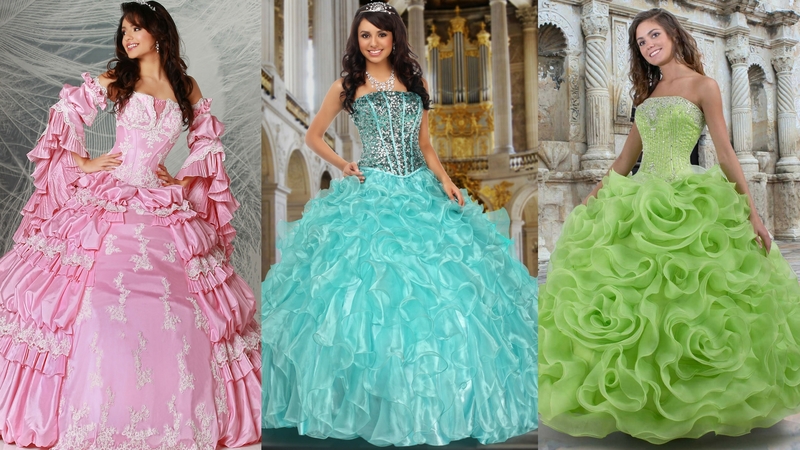 An offset satin bow at the waist caps a skirt of cascading organza ruffles. An optional shawl of organza is available in a matching color. Organza rosettes in full bloom, a straight-across bodice with pintucks, jewel and sequin embellishments, and a long, figure-flattering dropped waist makes this gown a stylish yet conservative dream. This gown of taffeta and organza features a ruched bodice with embellished embroidery on the bust and around the back, as well as delicately embellished pickups in the skirt. You can order a matching bolero for an even more modest look. Starting with a stunning, fully sequined straight-across neckline, the bodice of this dress features vertical piping atop cascades of organza ruffles. 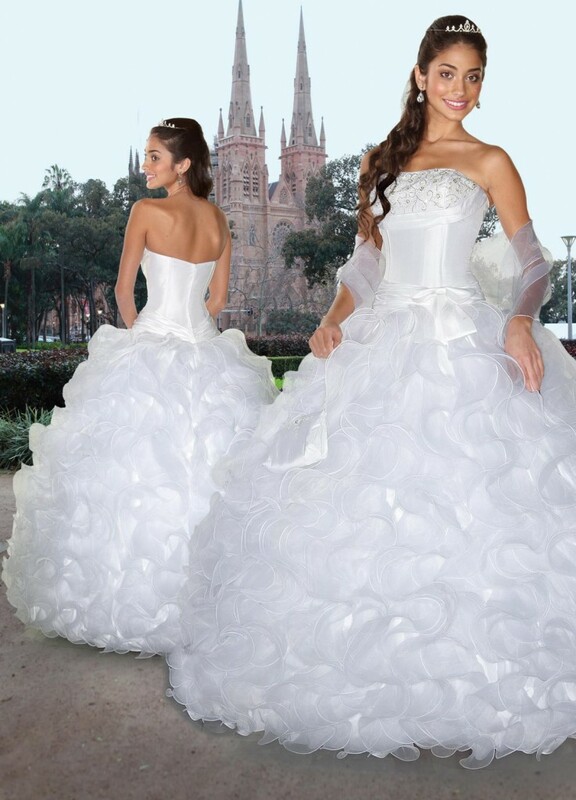 A matching organza bolero is available as well. 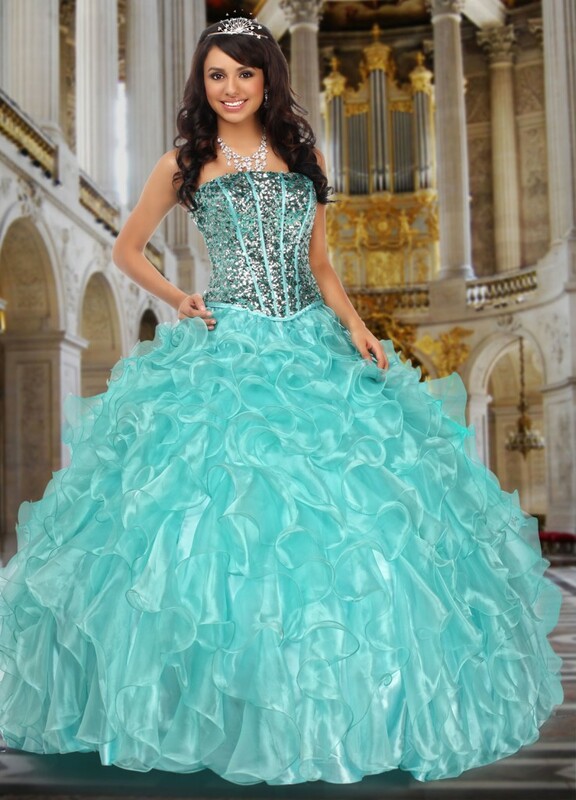 This dress is available in Aqua/Silver (shown), Dark Fuchsia/Silver, and White/Silver.